Design and construction of all types of conveyors. Motors - Gearboxes - Variable Speed controllers - Rollers - Drums - Bearings - Belting . Chain, wire rope and synthetics plus accessories to suit. Lifting chain, Transport Chain and Commercial Chain, Roller and Drag chain. "C.M.G." and "TECO" brands, in single and 3 phase, gearboxes and variable speed controllers. New and Second Hand, Cleated and special prupose belts. Clip joining, hot splice and patching. Quality "Sherwell" for grain, feed and Macadamias. is a brand that has been manufacturing Macadamia Handling Equipment since 1993. It was incorporated by macadamia producer, David Barnsley, who was not satisfied with the sub standard equipment, such as dehuskers, that were available. As a macadamia producer, David has been able to work hands on with the equipment and design new and better methods to ease the burden of handling. When you use the macquip range, you know it has been thoroughly field tested and your ensured complete satisfaction backed up by our 12 month macquip All Inclusive Warranty. macquip RECEIVAL BIN - All galvanised construction, fitted with adjustable trap-door and chain driven agitator to eliminate blockages. Designed for outside the shed. Macquip VARIABLE SPEED BIN ELEVATORS - Fully enclosed with wide belt and the speed control cited next to the operator. Nut retun fitted to eliminate spillage. Macquip DEHUSKERS - The most important component in the shed, the dehusker efficiency affects the whole system. Our latest is the "MacQuip Rambo" which is quiet, built as strong as an army tank and not frightened of rocks. The machine has separate motors with a forward and reverse switch on each scroll and is easily adjustable for different varieties of nut. Macquip ROTARY SORTERS - The Rambo dehuskers are very efficient and only require a small rotary sorter. The sorters are custom designed to suit each dehusking line. 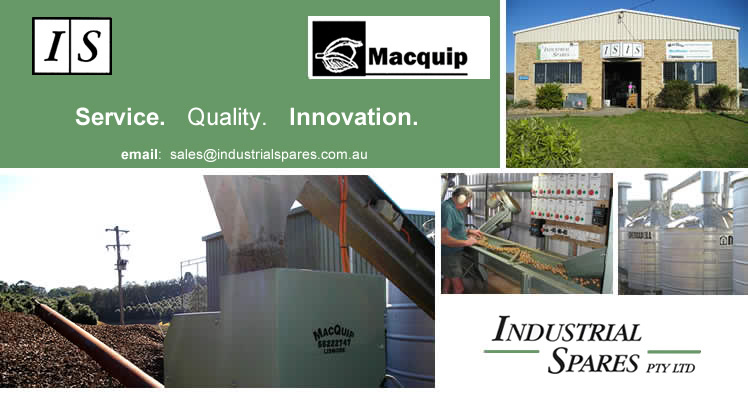 Macquip FANS - Mill fans for waste disposal and Axial Fans fro drying silos. Macquip SORTING TABLES - Designed by people who use them. Fitted with a near side waster rail and two waste outlets. Macquip WATER SORTERS - Our proven "waveless" design using a hot-dipped valvanised auger. It eliminates the need for a conveyor belt working in water. It has the optional "drained" bypass chute which eliminatges much of the water from the silo. Macquip VERTICAL ELEVATORS - Exclusive to macquip. All galvanised construction for outside use. Easy to install, space saving, eliminates roof plumbing, and comes with maintenance platform and circular splitter boxes an option. SILOS - Quality Sherwell "Reverse Flow" and Standard types. High Performance fans, safety ring, internal and external ladders, 360 degree outlet chute and open space under silo. Now fitted with quite fans as optional. Macquip ROLLER MILLS and HAMMERMILLS - Designed for the demolition of floaters and rubbish nut. The machines fits in as part of the waster system in a dehusking line or as a stand alone item. Allows you to spread the crushed nut out with the husk. 240v-415v. MOISTURE METER - Takes the guess work out fo checking the moisture of NIS is silos and inturn gets the best results from the water sorting. Macquip NUT CRACKERS - Electric, to suit cracking for the markets, or home use. Very strong but half the weight of the wooden bin. Mesh sides and can be stored in the weather. Fitted with a small fan they can be used as a drying silo.